Do you want an original and at the same time creative party for your child, a business event for colleagues which will bind through color, collaboration and out of the box thinking or just a pleasant outing with friends and/or family? 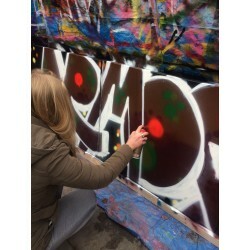 Then a Graffiti Workshop is exactly what you need. GRAFFITI WORKSHOPS There are 3 products. GRAFFITI WORKSHOPPIN' WITH THE BOYS! WORKSHOP-SESSIONS DELTION COLLEGE. PROJECT "POVERTY IN HOMETOWN ZWOLLE". 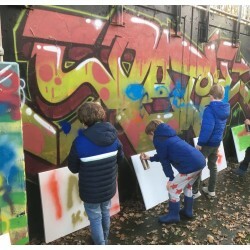 WORKSHOPS 10 YEARS ZeS OP MAAT, ZWOLLE.